Coral Lorenzen, co-founder of the pioneering Aerial Phenomena Research Organization (APRO) with her husband James Lorenzen, was born in Wisconsin and graduated from high school in May 1941. When nine years old, she experienced her first UFO sighting with two playmates and this would start her life-long interest in the UFO subject. Mrs. Lorenzen worked at various jobs and mainly for the American Navy and Douglas Aircraft. She put a lots of effort to preserve and gather information on UFO sightings at APRO which otherwise would be lost in history. 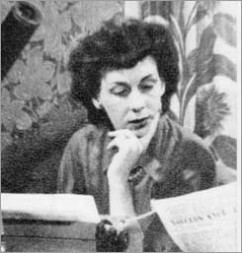 She served as a director for APRO until until 1964, when her husband James Lorenzen took over the post. She was author and co-author of several books on the UFO subject.